When you are expecting a delivery from any courier or postal service, one of the biggest challenges you probably face is to properly track your shipment. Some courier services do provide you with a tracking ID, but generally, you need to manually check the status of your shipment. Unless the service has ties with a major e-commerce company, it is usually unlikely that you’ll find a dedicated tracking service that automatically keeps you updated with shipment status changes. 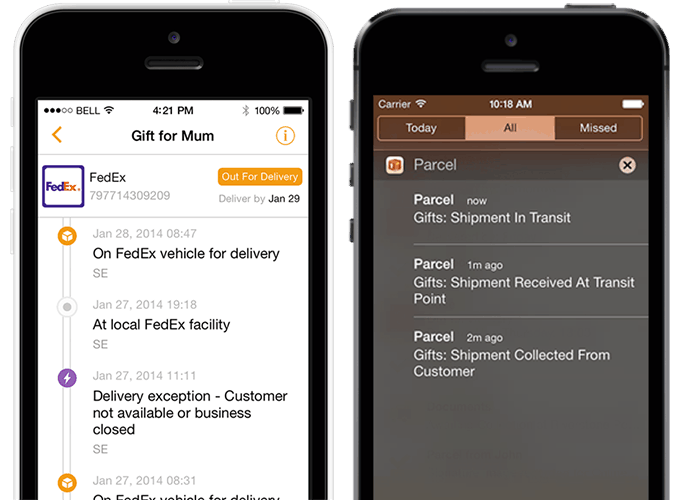 Some services do provide mobile apps to give you push notifications for shipment status. But then again, if you usually receive frequent packages from multiple services, you’ll need to install individual apps for each of them. Also, most courier services don’t even have mobile apps. What if a single app could provide integrated push notifications for all of your shipment status updates across multiple courier services from around the world. In fact, there are a few apps that already allow you to do so. In this article, we’ll explore some of these apps. Aftership supports more than 235 postal and courier services from around the world and lets you track the status of your packages being handled by any of the supported services. Once you provide a valid tracking number for your shipment, it will automatically detect the courier name and fetch other details such as item to ship, shipping history, current status of shipment, etc. You can manually select the courier service name in case it is wrongly detected. Tracking ID can also be scanned using a built-in barcode scanner. It also gives push notification every time the status of shipment changes – Info Received, In Transit, Out for Delivery, Delivered, Failed Attempt, and any other delivery alerts from the courier service. In addition, the app also saves all your tracked shipments in case you want to refer to it at a later time. Supported couriers include FedEx, UPS Mail, USPS, DHL, Blue Dart, DTDC and many more popular services worldwide. Aftership is freely available on the App Store (iOS) and Android (Google Play). Parcel is another package shipment tracking app similar to Aftership which supports more than 240 courier and postal delivery services worldwide, including services like Royal Mail, HDNL, UK Mail, Yodel, Deutsche Post, TNT, UPS, USPS, FedEx, etc. Tracking data is collected in the server and pushed to the app, so that you get all your shipment notifications directly on your device. Like Aftership, it can automatically detect the courier name from the tracking number and can provide push notifications for changes in shipment status. Additionally, the delivery of package can also be viewed on a map. Parcel is available for free on the Mac and iOS App Stores, but this version only allows you to track up to three simultaneous shipments and does not provide push notifications. To unlock these features, you need to upgrade to the Pro version. Slice is a great app for keeping track of all your online purchases. Though its shipment tracking capabilities are limited, with support for only a limited number of courier and delivery services, it’s actually more useful as a one stop destination for managing everything you buy and sell on the Internet. To use Slice, you need to register for an account and link your email address to it. Once linked, Slice scans your email for all your online purchase receipts and organizes them in various views, giving you detailed stats on your overall purchase trends. You can also track shipments from a limited number of popular delivery services including DHL, FedEx, UPS, USPS, Prestige, OnTrac, etc. Slice is available as a web based app, and is also available for iPhone, iPad and Android devices. If you know of any better integrated shipment tracking services that was not mentioned in this article, do let us know in the comments below. Like this article? Browse the related posts section to discover more.